Susan Ironfield was born in Accrington, Lancs. She studied languages and music at Liverpool University. After publishing some poetry and articles in magazines, she turned to painting on musical, psychological and astrological themes, and had many exhibitions in England and Germany. In 2010 her book Full Circle, Astrological Signs in Verse was published by Janus. 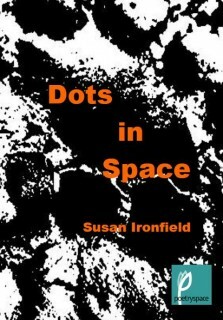 Fungus, pigeons, beetles, a dead gull; aspects of life that might go unnoticed are brought under the microscope by Susan Ironfield in this fascinating set of poems. For this poet it is the smallest of details that hold meaning and even a seemingly big and mysterious subject like black holes are brought sharply into a human focus.